Not to be confused with Jaguar XJ. The X-Type was Jaguars attempt to compete in the compact executive car segment. Jaguar and parent company Ford envisaged the baby Jag as Jaguar's first compact 4-door. The X-Type was one of the last to be styled under the supervision of Geoff Lawson, with the principal designer credited as Wayne Burgess. 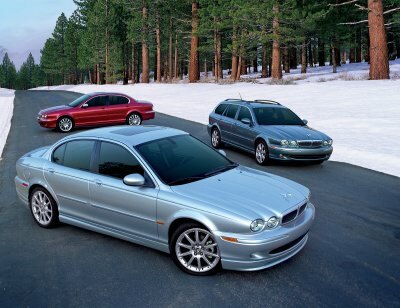 Neither Jaguar nor Ford had a suitable small rear-wheel drive platform to base the X-Type on, and the decision was made to base the X-Type on a modified version of the Ford CD132 platform, the basis for the 2000 Ford Mondeo. In order to distinguish it from its rivals and its Ford origins, the X-Type was initially offered as all-wheel drive only and mated to a 2.5 litre and 3.0 litre V6 petrol engine. In 2003, the X-Type was offered in front-wheel drive with the introduction of Jaguars first diesel engines, and with the smaller 2.0-litre petrol V6. In 2004, a further body style was added with the introduction of a estate version, making it the second-ever Jaguar estate car. In the United States, the estate was officially known as the Sportwagon.